A few days ago, I posted a review of Bob Marley & The Wailers’ soon to be released album, Easy Skanking in Boston ’78. In my review, I explained that come February 17th, you can buy an audio version of this concert album, which was recorded in Boston on June 8, 1978. There are also CD/DVD and CD/Blu-Ray versions being released; they include partial concert footage interspersed with some really cool animation. I just received the DVD that goes with Easy Skanking in Boston ’78. Having watched it, I can say without hesitation that the video is a very good accompaniment to the album. 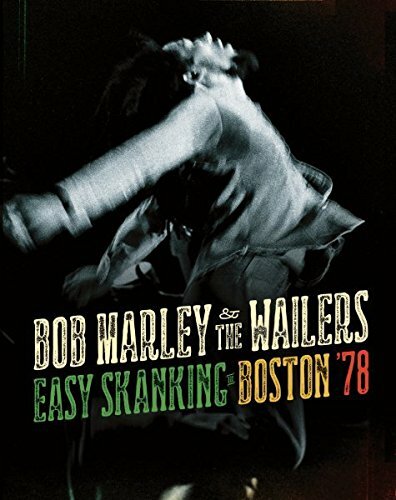 The DVD or Blu-Ray disc that comes with the deluxe versions of Easy Skanking in Boston ’78 runs for 46 minutes and includes seven live versions of the songs from the album. According to Bob Marley’s official Web site, the video was shot by a fan with a hand-held camera who was allowed to sit directly in front of the stage. There are a few times in the video where I was reminded that the video was apparently shot by an amateur. At the same time, the editing for the concert video is pretty good. This promo offers a glimpse at what the concert DVD is like. The DVD for Easy Skanking in Boston ’78 reminds me more of a music video than a concert, since there’s animation during the music interspersed with the footage from the show. I’m guessing the very best parts of the live footage were used. The lighting is low on the stage, making it sometimes hard to see everyone. On the other hand, there are several times in the video at which I caught a glimpse of just how much joy Bob Marley & The Wailers had for performing. Lead guitarist Junior Marvin is especially into it, engaging the crowd, dancing, clapping, smiling, and stirring up a lot of energy. He’s a lot of fun to watch. The animation in the film was created by S77, a well known design studio based in Columbus, Ohio that has created animation for a number of world renowned clients. I really think their work on the animation added a lot to the concert footage. It’s very colorful and psychedelic and gives the film a really cool euphoria vibe. If you decide to purchase a copy of Easy Skanking in Boston ’78, I highly recommend springing for the deluxe version that comes with the concert on DVD or Blu-Ray. Normally, I really like to just listen to my music, but I think the video footage and animation genuinely adds to the quality of this exciting new release!